No kidding, competitors from around the world (or at least the UK and evidently some “Kiwis” who were identified in the photo gallery) will chase down this practically VERTICAL hill after a wheel of cheese. 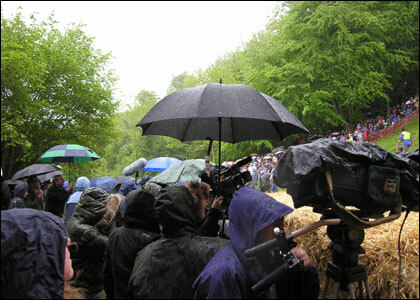 Of all Britain’s weird and wonderful customs and traditions, the annual cheese rolling races at Cooper’s Hill in Gloucestershire must be among the strangest – and certainly the most spectacular. 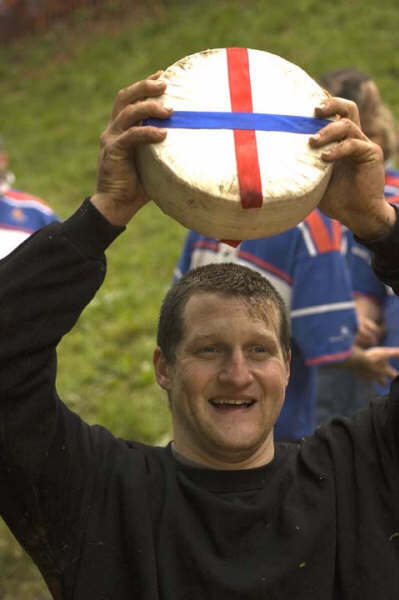 It takes place every year on Cooper’s Hill near Brockworth in the last weekend of May, and it sees scores of men and women hurtle 200 yards down a near vertical slope in pursuit of a seven-pound Double Gloucester cheese. Thousands more gather to watch the remarkable spectacle which has been happening almost every year for at least 200 years, and it is believed, possibly many centuries more. 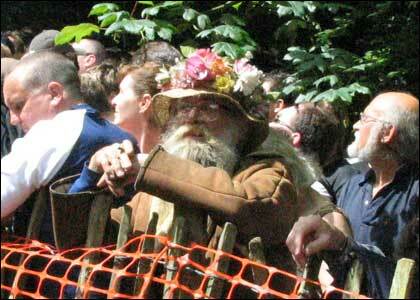 It seems that originally the event took place at midsummer. At some point it was moved to Whit Monday and in 1967 it was moved again, with the bank holiday to the last Monday in May. 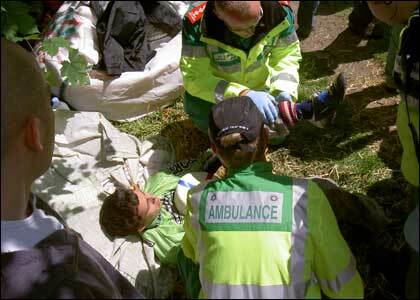 The two pictures on the left are from this year’s race (the second an image of one of the WINNERS), but the view on the right is of a competitor from 2004 who RENDERED HIMSELF UNCONCIOUS and had to be taken away by ambulance. 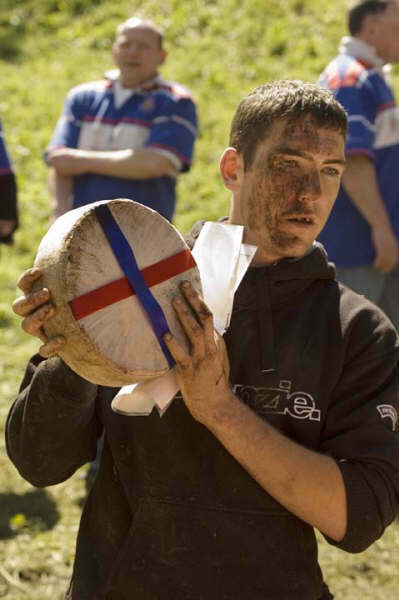 This is better than rugby; there’s mud, no protective gear is utilized, there are many disfiguring accidents, AND there is CHEESE! 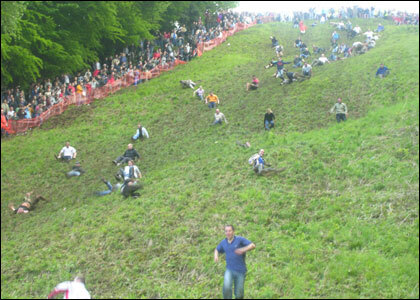 Cheese rolling races are believed to have been held at Cooper’s Hill, near Gloucester, for hundreds of years. 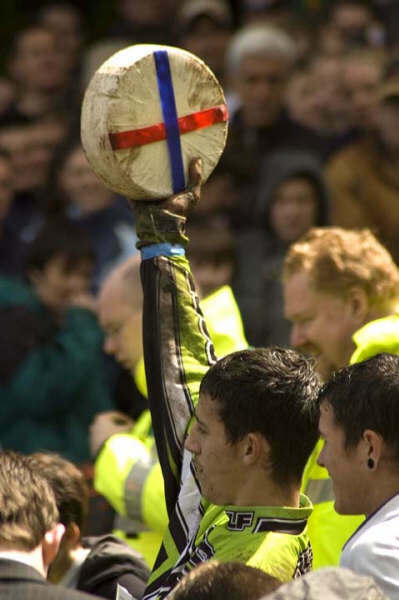 It was already an old tradition in the early 19th century. 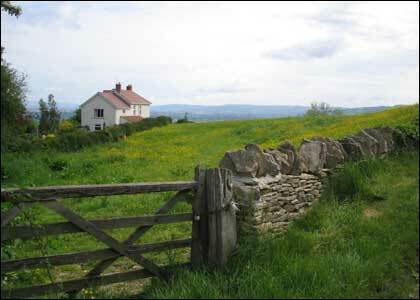 Its roots may lie in ancient fertility rites or hopes of a successful harvest. 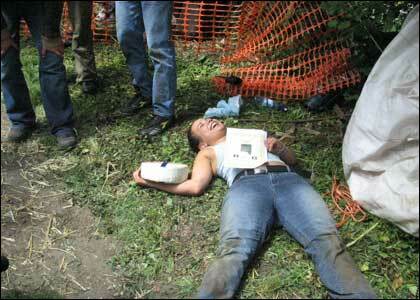 Competitors chase a Double Gloucester cheese weighing 7-8lb. During rationing in the Second World War the cheese was replaced by a wooden replica – still with a piece of cheese inside. 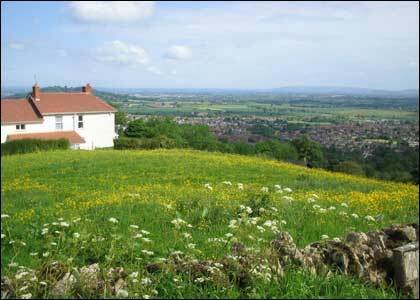 Cooper’s Hill has a gradient of 1 in 2 for most of its height and a precipitous 1 in 1 in places. 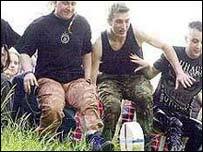 There are four downhill races, one for ladies, and uphill races for children and the really fit. The downhill race start point is marked by a maypole topped by a cockerel. 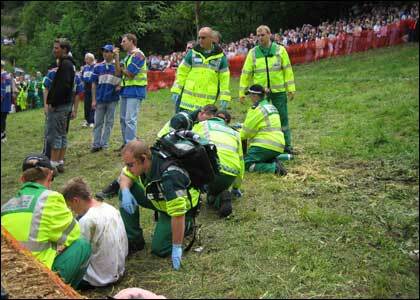 The 2001 event was cancelled as a result of the foot and mouth crisis. 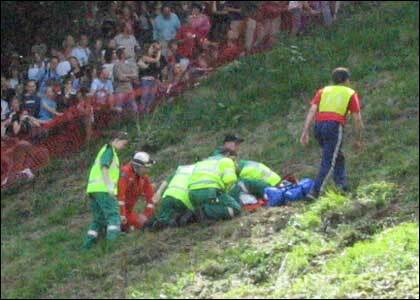 The 2003 event was cancelled because of an Earthquake! 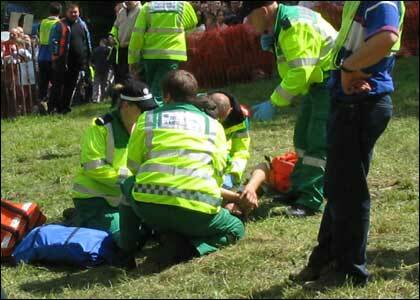 To get a REAL feel for this wacky dairy sport, watch Chaotic Race 5 and the Cheese Rolling Montage. Also, check the other pictures HERE. 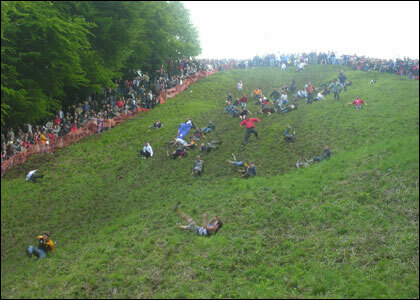 Lastly, check out the OFFICIAL Gloucestershire Cheese Rolling site for this page about past activities connected to the “Cooper’s Hill Wake” (back to the 1800’s). My favourites are “‘grinning (through a horse’s collar) for a cake” and – I kid you not – “shin-kicking!” Now THAT must have been a good time.